He is currently General Manager Corporate & Group CFO of Salini Impregilo S.p.A. and member of the Board of Directors of Lane Industries Inc. He is also Board Member of Tim S.p.A., Equita Group S.p.A. and Cairo Communication. He has a role as Professor at Luiss Guido Carli University in Rome. 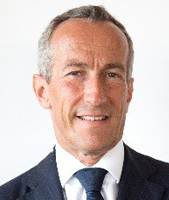 He spent more than 20 years in the Asset Management industry as portfolio manager, head of investments and CEO in various companies (Fondinvest, Gestifondi, Romagest, Capitalia Asset Management, Fineco Asset Management). He has also served as Head of Issuer Division of CONSOB (Italian Market Authority). Past appointments saw him Board Member of Borsa Italiana S.p.A. (Italian Stock Exchange), member of Assogestioni, Assosim and Assoreti. He holds a Degree in Economics and Business Administration from the LUISS Guido Carli University of Rome.